Now that you know why we cloth diaper, I want to tell you about the diapers we like. When I first started looking into cloth diapers, the big question was what kind to get. Believe it or not there are several types and brands of diapers. I'm not even going to try to give you and overview of the types of diapers. It would be more than this poor mommy can handle. Instead, I'm going to tell you about the ones we use. 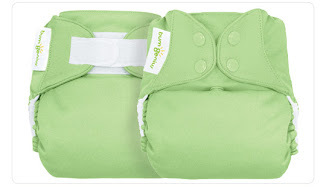 We use a combination of BumGenius and Flip One-Sized diapers. The BumGenius are pocket diapers. The diaper itself has a waterproof outer shell and an inner fleece lining. Between these two layers is a pocket that you stuff an absorbent insert into. This insert actually absorbs the "mess" and leaves the layer against babies skin relatively dry. When you change the diaper you just shake this insert out into a wet bag (*this is the bag we use to keep dirty diapers in until it's time to wash), then throw the diaper and any wipes (we also use cloth wet wipes) into the wet bag as well. I like these pocket diapers because they are so easy for anyone to change. The actual diaper changing process is the same as with disposables. I pre-stuff the diapers before leaving him with someone, and I just ask people to fold the soiled diaper up and put it in a small wet bag we keep in the diaper bag. I deal with shaking out the inserts when we get home. It's super easy! The Flip One-Sized Diapers are an insert and cover system. This means that instead of stuffing the insert into a pocket, you lay it inside of a water repellent cover. When you change the diaper, you simply throw the soiled insert into the wet bag and replace it with a clean insert using the same cover. I can usually get 3 diaper changes out of one Flip cover before needing a fresh one (assuming the diapers are just wet, if we have a dirty diaper it's a different story!). I like the Flip diapers for two reasons. They are significantly cheaper per diaper then the FuzziBunz. Each cover comes with three inserts so it's three diapers for the price of one! Secondly, I like taking the Flips with us when we'll be out all day because the inserts take up less space in his diaper bag and less space in the wet bag. If you are interested in cloth diapering, but are slightly overwhelmed by picking a brand I completely understand! When we started looking at cloth diapers, I was so confused by all the different varieties. My solution was just to try a little bit of everything. I ordered one of several different brands and styles and just tried them out. I still use the miscellaneous diapers we've collected when all of our regular diapers are in the wash. They make for a great back-up plan when laundry just doesn't get done. Hope this helps any of you mommies considering cloth diapering! *Also, I borrowed these pictures from the companies' websites (which I linked back to in my post for your convenience). Not sure if that's legal? Most of the pictures I post belong to me that way I don't have to worry about copyright, but in this case I'm going to risk it! (Oh yeah! Life on the edge) I mean I'm advertising their products, so maybe they won't mind. Glad you are enjoying cloth diapering. I'm a big fan. We use FuzziBunz during the day and do BumGenius doubled up at night. When the bear was smaller we also used Econobum with their prefolds and some of my own flat fold diapers. We also use cloth wipes (FuzziBunz double sided wonder wipes) with a homemade solution made of water, Dr. Bronner's liquid soap, and apricot oil. I love cloth diapering and don't know how people do disposables!